Approximately 77”/195.5 cm wingspan and 37”/94.0 deep after washing and blocking. Dipped, you can create a stylish accessory that will make you smile, even if there are a few clouds in sight! 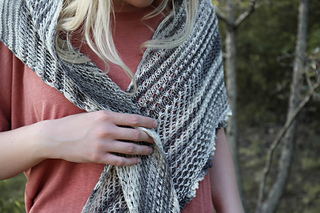 This asymmetrical shawl works up quickly with an open mesh stitch. This dye style is magical as it creates effortless stripes right into your work! flat and size to obtain gauge.